We prepare a big room of the continuation between two rooms for the family or the group who can use it by one room by five people. 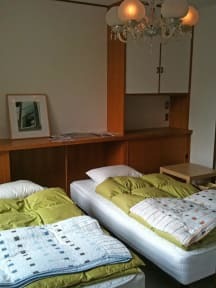 Also two Dormitory rooms by 3 people for Men or Women and 1 twin room. Moreover, we prepared the kitchen, living room, bath room, laundry and toilets as common space. -You can reserve a parking area when you reserve your room, let us know if you need it. -You can park your car until 10:00 check out time. - Inquiry by telephone also within this time. -You can left your luggage at Front, you can be free on your sight seeing on the day you leave. 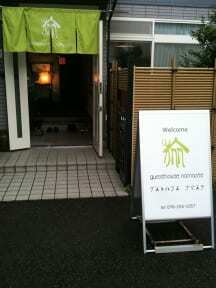 -We have a big towel 100 YEN and a small towel 50 YEN for rent. -We appreciate your great consideration to the people including the neighbors in the night time. Please keep quiet from 22:00 to 8:00. Very comfortable house near the train station and not far from the main places of interest. Cleaning and excellent services. There is also the possibility of cooking and storing their own food in the fridge. The host was really kind allowing us to leave the backpacks at check out. 2 bathrooms and 2 showers. Possibility to use the washing machine for a fee. recommended. Excelente relación calidad - precio, el dueño muy amable y dispuesto a ayudar. Estancia muy recomendable.